The ATV trails may be closed, but the Woodticks aren’t hibernating. New Map Project For The Chip! The Polaris TRAILS program has awarded our club a $5,000 grant to purchase a Polaris youth ATV and riding gear. It will be a great addition to our ATV Safety Education Trailer, helping us talk to kids and their parents about ATV safety and responsible riding. According to SVIA, 93% of youth fatalities on ATVs in the U.S. involve kids riding adult-size ATVs. That figure alone is reason enough for our club to keep promoting ATV safety across northern Minnesota. If you’d like to join our team of ATV youth instructors and DNR volunteer Trail Ambassadors, let us know and we’ll arrange a class for our area. We distributed the last of our 2,000 Adventure Trail activity books and crayons this week, to the Chippewa National Forest for the brochure racks in their brand new building in Walker, and to the Boys & Girls Club at the Walker Area Community Center. It’s a very busy place during after school hours, and Naoma, their director, was very appreciative. We used a couple hundred dollars from the DNR grant earned by our Trail Ambassadors to get 2500 more booklets to distribute next year! New Club Computer & Projector! We used some of our Trail Ambassador grant money to go high tech, buying the club a laptop computer, projector and screen to use for our safety training classes, club presentations, membership tracking and bookkeeping. Thanks to all our TAs for monitoring the trails and helping us buy this equipment. And thanks to treasurer Mike Ebinger for doing the shopping. Planning Club Rides For 2014! The club is 5 years old next summer. We’ve heard that members want more club rides and at new locations, so we’ll try to do that this year. If you have ideas for our rides and meetings, please let us know. And finally -- it’s Black Friday so here’s a reminder on club gear available for sale, shipped directly to your door! Just email your order (color, size, short or long sleeve, with mailing address) to Dave at dvhalsey@aol.com or call 612-723-1987. We’ll mail it and add postage (about $5) and email you the final amount due by check. 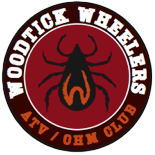 Happy Holidays From The Woodtick Wheelers Board!